You are here: Home / Off Page SEO / Is Guest Post Outreach Just a Numbers Game? Is Guest Post Outreach Just a Numbers Game? When we are talking about digital marketing and especially search engine optimization, the question of guest blogging simply has to be raised sooner or later. And as with anything SEO-related, everyone has their (usually very strong) opinion on guest blogging. One of the more important opinions on guest blogging has to be that of the biggest search engine in the world. Namely, Google’s own guidelines warn against guest blogging campaigns which are specifically for the purposes of link building. While this is something that scares many a website owner, people who actually do Google SEO for a living understand that this warning mostly concerns poor-quality guest blogging on websites that are best described as article-dumpsters. Such guest blogging really does offer little value and will probably cause the omnipotent Google to come down on you like a ton of bricks, and there is more value to be had in reviewing your internal linking structure. That being said, decent guest blogging campaigns where you actually do your homework, do not cut corners and spend serious time and effort on it will almost invariably work. The links built this way will definitely boost your website’s visibility and bring more traffic to your website. One huge part of guest blogging is outreach to other website and blog owners and in order to do a decent guest blogging campaign, you will need to have a great outreach strategy. Most people who guest blog, either for their own website or for their clients, lean towards one of two schools of thought when it comes to guest post outreach. The first one preaches sending out as many outreach emails as humanly possible, playing the numbers game from the title of this article. In essence, according to this theory, as long as you send out enough outreach emails, you will get a certain number of positive answers and you will end up with a certain number of guest posts. The second school of thought goes the other way and advocates sending out fewer outreach emails that are far more personalized and that will have a greater rate of success. Mass outreach has its logic and plenty of it. For one, by reaching out to a huge amount of websites, you are maximizing your chances of getting in touch with people who are glad to feature guest writers. This kind of outreach can also be automated to a great extent, further increasing the number of emails sent. This is the numbers game 101. Mass outreach is also a great choice for agencies and SEO professionals who are looking to deliver a certain number of guest posts and who also want an easy way to figure out how much work is being done. It is also easier to keep statistics and to modify one’s outreach emails when you operate with large numbers. The sample size is bigger and you will have more chance of getting actual results for your modifications and change-ups. Finally, this kind of outreach strategy better handles those days when you do not feel like doing outreach and months that are slow for whatever the reason. Targeted, more carefully tailored outreach emails can also be a huge success, once again for a number of reasons. For example, the success rates are far greater when you tailor each email to the website and the website owner you are reaching out to. Adjusting the little things, as well as major ones such as the subject of your proposed article will have a great effect on how often you will get positive results. Furthermore, with such an approach, you can move away from websites that are aimed solely at publishing articles and you can start contacting companies and organizations that do not get thousands of outreach emails. Links from such websites will always carry more weight than those from your run-of-the-mill “write for us” niche websites. It should be pointed out that even this type of targeted outreach can be streamlined with a few templates that are filled with specific website-sensitive details. Still, they will take much longer and usually cost more than your mass outreach emails that can be sent out extraordinarily fast. It should be pointed out that no one guarantees you will have that much more success with carefully crafted outreach emails that you send out in smaller quantities. 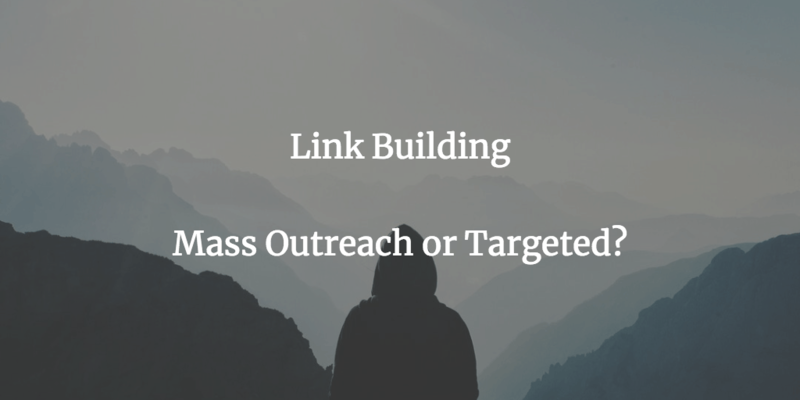 There are periods of time when you will be getting very little positive answers and in such situations, the relatively small number of sent outreach emails might hurt your link building numbers. In such situations, it truly does feel that guest post outreach is just a numbers game. There are a few other factors that you need to add to your equations when guest post outreach is in question. For example, there are niches where guest posts are really, really difficult to come by, at least for free. For example, the finance niche is notorious for the high percentage of website owners who ask for money in order to publish your guest posts. The same is true for the automotive industry. You should also consider the fact that some niches are much better represented and that mass outreach will have more success, like in the tech niche. Conversely, if you are interested in something more specific and esoteric, mass outreach will make little sense. In addition to this, your particular situation will determine your approach. If you are doing guest posting at your leisure and you do not have to show x number of emails sent and x number of links built, targeted outreach will make more sense. If you do have to report and show numbers at the end of the day, mass outreach will work best for you. Guest post outreach is too complicated to be considered purely a numbers game. There are too many factors that come into play for anyone to say it is as simple as sending out a certain number of outreach emails over a certain period of time. Perhaps the best way to answer the question from the title of this article is to say that sometimes it is just a numbers game and other times it is not.